Roman Norbert Ketterer, Campione d'Italia. Mr. Hans Ravenborg, by whom acquired from the above in 1965; his sale; Christie's, London, 11 October 2001, lot 21. H. Hess, Lyonel Feininger, London, 1961, no. 111 (illustrated p. 257). Gedächtnisausstellung, January - March 1961, no. 6 (illustrated); this exhibition later travelled to Essen, Museum Folkwang, March - May 1961 and Baden-Baden, Staatliche Kunsthalle, May - June 1961. Florence, Palazzo Strozzi, L'Espressionismo. Pittura, scultura, architettura, May 1964. Campione d'Italia, Roman Norbert Ketterer Collection, Moderne Kunst II, 1965, no. 32 (illustrated). The present work will be included as no. 135 in the forthcoming catalogue raisonné currently being prepared by Achim Moeller, New York. 'Weimar has always been and always will be the town of the miracle of my life', Feininger wrote to his wife Julia, from Weimar, in April 1913. For Feininger, a frequent visitor from Berlin, this peaceful and dignified Thuringian city provided the inspiration for many of the most radical developments in his art. Alongside the two churches of the nearby towns of Gelmeroda and Vollersroda, the small bridge over the Ilm river at Ober-Weimar, first shown to him by Julia on his visit there in 1906, was one of Feininger's favourite places to paint. 'How happy I am on this bridge I can't begin to tell you' he once wrote her, and like the two churches, this little bridge became one of the abiding motifs of his work and the location where many of his finest pictures were made. On the Bridge, painted shortly after Feininger's arrival in Weimar in the spring of 1913, was the second of two paintings the artist made of the bridge at this time, and it marks a dramatic shift in style. Feininger had originally abandoned an earlier attempt (at Bridge I) and, in this work, he developed another version that merged a detailed view of figures crossing the bridge from an earlier 1912 painting (Brücke O) with a new and emotive use of Cubist distortion. 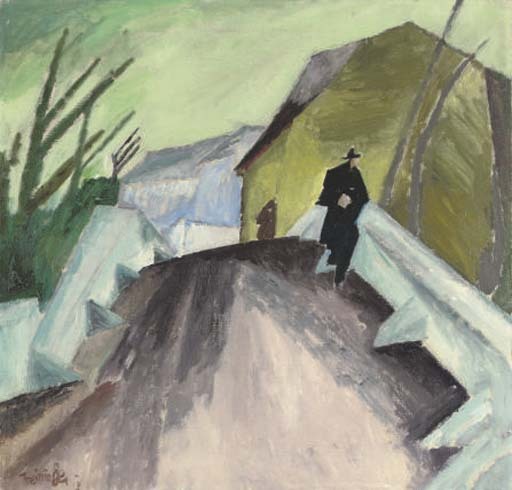 Depicting what is quite possibly a Jesuit (of the kind he had painted before and would revisit soon after this picture in Jesuits II), On the bridge attempts to convey something of Feininger's emotional response to the unique architecture of the bridge and to walking over it. This emotional condition, Feininger attempted to convey through his own unique 'cubism' - a technique that he described as being in many ways 'the reverse of the French Cubist's aims' based upon the 'principal of monumentality and concentration to the absolute extreme possible'. It was a focusing of his 'inner visions', either 'compositional or before Nature' and made 'after Nature' not giving an 'impression of it' that enabled him ' to learn, and to collect and widen my knowledge.' These new paintings, which Feininger declares began late in 1912, 'show far more than my notes, what I have received from nature... With each new picture I make giant strides, since the Fall (of) 1912 it seems to all acquainted or interested in my work, scarcely credible - but I am building upon a foundation to endure, and am very sure, now, that I am following the only possible lines for my development" (letter to A.V Churchill, 13 March 1913, quoted E. Scheyer, Lyonel Feininger: Caricature and Fantasy, Detroit, 1964, p. 167). Indeed, such was Feininger's excitement at the prospect of setting off to Weimar in the spring of 1913, that he, 'knew' he wrote to Churchill that 'this year is a critical one in my career... I am anticipating getting off to dear little Weimar on April 1st, where I intend to work out of doors, until October... I expect to produce very important works"(ibid). Between 1913 and 1914 Feininger painted the little bridge over the Ilm at least three times, taking a very different approach on each occasion. For a long time Feininger had been fascinated by the unique architecture of this bridge because, with its high arches, grandiose design yet miniature scale, it seemed to him to compress a sense of the monumental into a very small space. In all of his 1913 paintings Feininger consciously attempted to allow the intuitive feelings he held towards its architecture; he expressed his emotions by exaggerating and extending the angularity of its stone structure in such a way as to transform it into a seemingly living entity. In this way, and as he was to do with the churches of Gelmeroda and Vollersroda, the bridge over the Ilm became an architectonic expression of his own, often excited, mental state. On the Bridge is one of the freest and most expressionistic of all the paintings Feininger made at this time. Using a series of bold angular forms filled with free gestural strokes of subdued colour, Feininger has created a powerful semi-abstract composition that, like many of Kandinsky's paintings of the period, makes powerful use of its square format. Concentrating on the pathway on the top of the bridge and using an exaggerated perspective that expands extensively to fill the whole lower edge of the picture frame, Feininger manipulates the unique angularity of the bridge to create a striking composition, filled with tension and instability. From the dark trees and the broad flat walls of the houses to the triangular supports on the bridge and the figures of the two Jesuits walking over it, every element in the picture leans out and away from the dark central pathway of the bridge. This creates a sense of explosive spatial energy, similar to that established in the apocalyptic cityscapes of Ludwig Meidner. Only here, the feverish energy of these contrasting angles is restrained and held down by the pictorial weight of the dark central path anchoring these various tensions and holding them together into an expressive cohesive unity.